Grain elevators are an enduring symbol of agricultural tradition. Unfortunately, they present environmental problems, due to a legacy of the agricultural industry’s use of synthetic chemicals to help grow, store, and transport food. Since the 1970s, for example, grain producers have used fumigants containing chemicals such as carbon tetrachloride (CT) to protect stored grains from fungus and rot. Fumigants were typically stored in above-ground storage tanks at grain elevator sites, ready for use as needed. As professionals in the remediation industry well know, where there are storage tanks, there are leaks, and where there are leaks, there is the potential for soil and groundwater contamination. Such contamination is the reality at most, if not all, grain elevator sites. During the 1970s and 1980s, the owner/operator of a still-active grain elevator facility had regularly applied 80/20 grain fumigant (i.e., 80% CT and 20% carbon disulfide), as was common during that era. The fumigant compound was stored in an above-ground storage tank on the property before its removal in the 1990s. The site entered into a voluntary cleanup and property redevelopment program in 2000, following soil and groundwater detection of fumigant constituents of concern (COCs). These were primarily CT, but also carbon disulfide, chloroform, and methylene chloride. Groundwater impacts extended about 122 m down gradient from the site (the “source area”). To remediate the site, Burns & McDonnell Engineering Company, the consulting engineer for the project, recommended the installation of a dual-phase extraction (DPE) system. It has been operating since 2007. Remediation options at the site were significantly limited due to access constraints associated with ongoing facility operations, a steep grade change from the access point to the source area, active mainline railroad tracks, and other utilities and structures throughout the impacted area. Nonetheless, the remediation team was able to successfully and safely install the DPE system, including eight extraction wells, within the source area. 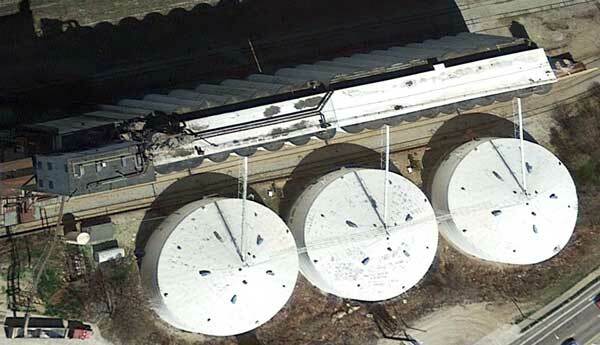 Overhead of the location of the DPE system at the grain elevator site. Over the period from 2007 to 2014, the system achieved significant contaminant mass reduction, removing over 4,130 kg of COCs in the vapor and dissolved phases. About 28.5 million litres of groundwater were recovered and treated during this time period. Evaluations of DPE performance in 2014 found that, while the system had succeeded in removing a very large amount of mass and significantly reducing the lateral extent of the source area, a subset of source-area extraction wells continued to exhibit elevated (i.e., source-level) COC concentrations in groundwater. The system had dramatically reduced source mass and prevented migration of the plume as intended, but a remnant, highly concentrated source still required remediation. As a result, an additional investigation was conducted using high-resolution site characterization techniques to assess the nature and extent of residual COC mass in the source area. The investigation results indicated significant sorbed-phase COC mass, generally limited to the shallow, sandy interval of an area bound by the DPE wells exhibiting elevated COC concentrations. 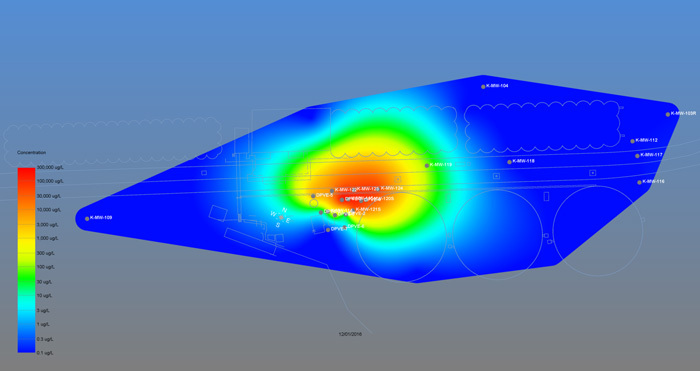 Historical light non-aqueous phase liquid (LNAPL), heavily impacted with the site COCs, was also identified. Burns & McDonnell used the data generated by the investigation to evaluate alternatives for expediting the source-area remediation and maximizing the effectiveness of the DPE system. During the course of evaluating alternatives, a presentation at a remediation industry conference, describing a project with similar site conditions, led Burns & McDonnell to believe that surfactant-enhanced extraction (SEE) would be a viable option. The company also had a previous relationship with surfactant technology developer Ivey International Inc. (Ivey) in a separate petroleum remediation project. 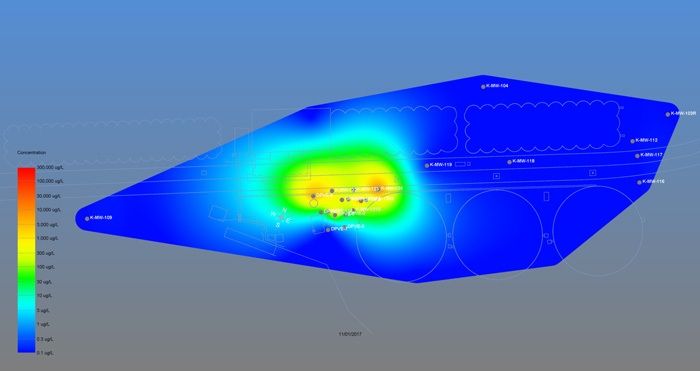 Based on these factors, Burns & McDonnell decided to conduct a SEE pilot study in 2015 using the Ivey-sol® 106 (Cl) surfactant formulation, which was specially designed to treat chlorinated solvents at the site. If the pilot study yielded positive results, a full-scale project would follow. Ivey-sol® SEE surfactant products consist of several patented and/or proprietary non-ionic formulations that can selectively desorb sorbed COCs and render NAPLs miscible in the aqueous phase. Surfactants have a structure with a hydrophilic head and a hydrophobic tail; the hydrophilic tail attracts and attaches to the organic portion of CT and similar molecules, while the hydrophilic head attracts to groundwater, thereby making the CT molecules miscible. Ivey-sol can do this without emulsifying the COCs, thereby increasing their availability for remediation, while not impacting the performance of wastewater treatment systems. 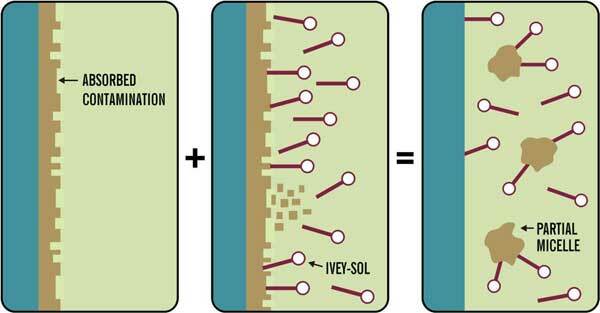 Ivey-sol desorption mechanism operating on soil surfaces or LNAPL layers, making COCs more available for remediation. Ivey’s products accomplish three goals. Firstly, surfactants overcome the “limitation” challenges associated with contaminant sorption and solubility. Secondly, they lower the relative surface tension of water, thereby improving its wetting and associated hydraulic conductivity properties. Thirdly, through their selective dissolving of COCs below the critical micelle concentration, the surfactants broaden the range of contaminants that can be treated and enhances physical, biological, and chemical remediation, in situ and ex situ. According to Ivey, their surfactant products are non-toxic and biodegradable, so they do not persist in the environment after application, which can be verified with Ivey-sol field test kits and by three USEPA laboratory test methods. Indeed, because they are non-toxic to bacteria, they can also give a boost to natural attenuation. They have some disadvantages that careful application can overcome. For example, their effectiveness may be diminished if the mixtures freeze during storage, and their deployment may suppress VOCs, making them less detectable by standard, handheld vapor meters. For the pilot study at the grain elevator site, which was conducted in April and May of 2015, Ivey-sol surfactant technology was deployed in single-well “push-pull” tests and multi-well “point-to-point” tests at two DPE system locations and two groundwater monitoring wells . Burns & McDonnell was able to use the existing DPE and well infrastructure to implement the surfactant injection and product recovery, thus minimizing intrusive activities and cost. Groundwater was encountered approximately 2.1 m – 2.4 m below ground surface. The lithology within the targeted source zone generally consisted of well-sorted, loose, silty sand to depths ranging from 4 m – 5.2 m below ground surface, underlain by a silty clay. Ivey have found that their surfactant products are effective in site conditions with more varied and complex structure, including course-grained, fine-grained, and higher silt and clay-content soils. For this pilot, Ivey-sol surfactant was mixed with water in a 1% – 2% solution, which was gravity-fed into two monitoring wells and two DPE wells to achieve a targeted injection diffusion radius and then allowed to remain in the formation for a prescribed residence time. Overall, concentrations of groundwater and soil vapor recovered by the DPE system, immediately following surfactant flushing, demonstrated increases of up to four times (>400%) more than the average concentrations observed under normal DPE operational conditions. Based on these positive results, Burns & McDonnell elected to conduct a full-scale Ivey-sol SEE test from August through November of 2016 to address remaining COC mass within the source zone. For the full-scale test, 1045 litres of Ivey-sol 106 surfactant was mixed with potable water and a conservative tracer for observation of the solution’s distribution. Three additional monitoring wells were installed to facilitate surfactant delivery to the northern portion of the source area. Five Ivey-sol SEE phases were conducted to target the portion of the area with the highest COC concentrations, applying point-to-point surfactant delivery to the core source area within the shallow saturated zone, followed by groundwater extraction from the wells that were initially used for surfactant injection. Burns & McDonnell monitored recovery progress via real-time tracer testing and field surfactant test procedures developed by Ivey. Ivey-sol 106 surfactant is mixed with water, with the addition of a conservative tracer for monitoring purposes, prior to injection. A key result of the full-scale activities was a dramatic increase in COC mass recovery rates. During the short SEE implementation and 12 month monitoring period, the surfactant-enhanced DPE system recovered more than 25% of the total mass that the DPE system had recovered over the previous 10 years. In addition, recovered groundwater concentrations up to 30,000 micrograms per liter (µg/L), more than five times (>500%) the highest concentrations ever observed during DPE operation, were observed during the SEE monitoring period. Groundwater plume COC concentration December 2016 (above) and groundwater plume COC concentration November 2017 (below). COC concentrations in groundwater plume before and after Ivey-sol application. Groundwater plume COC concentration in November 2017. Overall, the full-scale SEE test achieved 98% CT reduction in the source area’s shallow monitoring wells and 92% reduction in source area DPE wells. Moreover, although not the primary objective of remediation activities, significant reductions in LNAPL thicknesses were observed. The DPE remediation system, enhanced with Ivey-sol 106 (Cl) formulation, successfully recovered the LNAPL product as a serendipitous benefit. 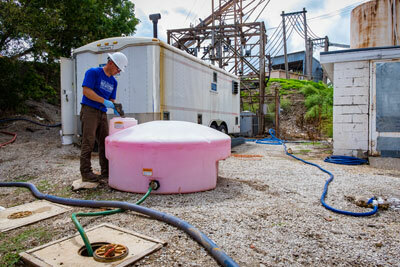 The remediation team estimates that the full-scale SEE system saved about a decade in active remediation time. With the cost of operating and maintaining the DPE system totaling up to $100,000 annually, the potential cost and time savings involved in deploying surfactant technology to complement DPE technology and recover more highly concentrated COC mass are readily apparent. Eric Dulle is with Burns & McDonnell. George “Bud” Ivey is with Ivey International. This article will appear in ES&E Magazine’s December 2018 issue.